Idol group Big Bang has been recently chosen as the new faces for the global and popular outdoors brand, “The North Face”. Last July Big Bang were in the process of shooting the TV campaign “Never Stop Exploring” in New Zealand. 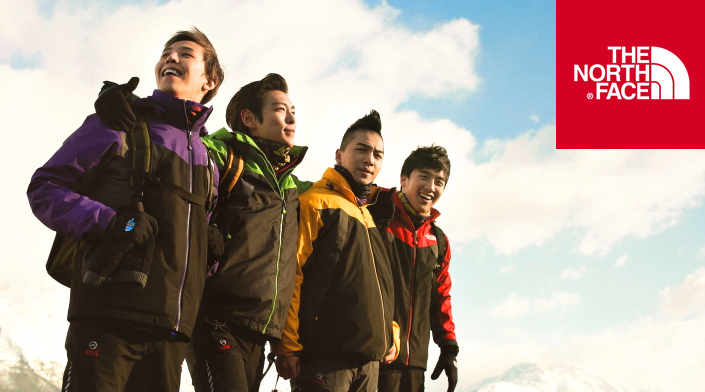 The video holds contents of the Big Bang members experimenting the ‘real outdoors’ with “The North Face” products and at the same time challenging the limits. Meanwhile, Big Bang’s images and videos in New Zealand for “The North Face” will be released in mid-August to the public. It is common that the idol groups break up 5 years after their debut, for instance, H.O.T., DBSK, SS501,etc. All of these groups were disbanded after they had debuted for 5 years and they had to start their solo activities. However, the situation is different now. The represtatives who can break this jinx are Big Bang and Super junior (who have just released their 5th regular album, Mr. Simple ). They are still staying together after debuting for 5 years and even more, they show us their competence of staying in this industry has been enhancing throughout these years. The first reason is 'the members do really wish to achieve their targets'.There is a common thing shared between Super Junior and Big Bang, after 1 year of their debut, they did not receive much attention from the public. Although both SME and YGE are big entertainment companies, the music brought forth by both of the groups could not win the love of the public in the 1st year of their debut. However, this brought positive influence to the groups since the members of these groups devoted themselves even more to achieve their dreams. Their committment united the groups too. The different ideas and dreams that the team members own have contributed to the success of the groups. Their determination enables them to last for more than 5 years. The second reason is the personalities of the members do not overlap with each other. The members of Super Junior are good at performing arts. The creativity of Heechul, the good singing skills shown by K.R.Y when they were delivering the emotional songs and the talent of hosting variety shows shown by Lee Teuk and Shindong in SBS' Strong Heart' all show how different they are from each other. It is also the same case with Big Bang. 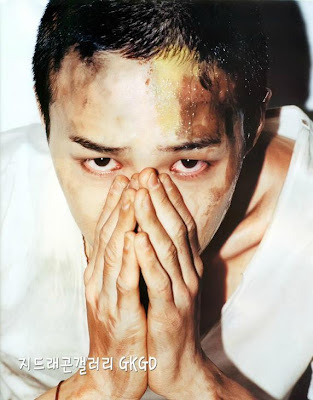 The leader, G-Dragon is responsible for composing the songs for the team directly. The handsome hyun T.O.P. is talented and has a naughty side. Daesung and Seungri are talented in doing variety shows while no one can cast any doubt on the solo performances of Taeyang. Although they have different skills and personalities, they are not jealous of each other. The final reason is that they have very strong friendship with each other. 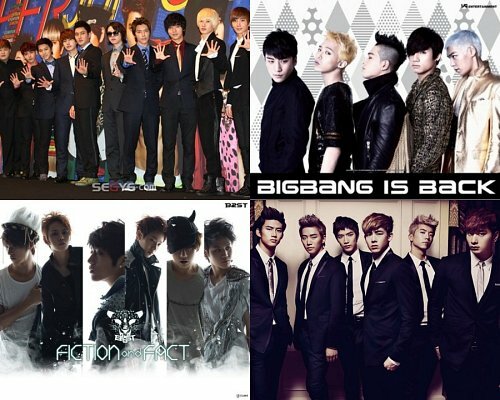 There are no major conflicts among the members of Super Junior and Big Bang. Although at their 20s, they might argue or even fight with each other, they settle the issues quickly.Their friendship became more consolidated after all of these and it is the foundation that they can walk together on this path for more than 5 years. The breaking of the jinx by Big Bang and Super Junior has become an inspiration for other group currently. We hope that the jinx will disappear totally in the coming future. Big Bang featured on MTV Style, USA! Oh man. Why are androgynous dudes so fly? No seriously, I have nothing against a brolic guy with a neck like a bridge abutment, or tatted-up sinewy lads with vascular forearms and elegant hands that are articulate but work-worn enough that you could light an old timey match off the palm, but when a VERY PRETTY manboy has the gall to look better in makeup and jewelry than I do, I get SO mad that it is SO HOT. Case in point, the members of K-pop crew Big Bang. First of all, your man G-Dragon as a blonde with a hella ’90s grunge theme in a skully and a mess of rings looks fantastic. That he’s also stunting in silver reflective Minx nails scrambles my brains. And T.O.P. in matchy-matchy mercury tips needs a GIF of flashy spirit fingers so I can just see it over and over behind my eyelids to coax me to sleep. THESE are things I NEED. I want everything that is happening in these images, she says. While playing the “Haru Haru” video on repeat and making all the non-Kreen speaking individuals on my floor crazy. WITH ENVY. ALSO (because really can there be enough words when I’m rhapsodizing like a spazz about boy bands? 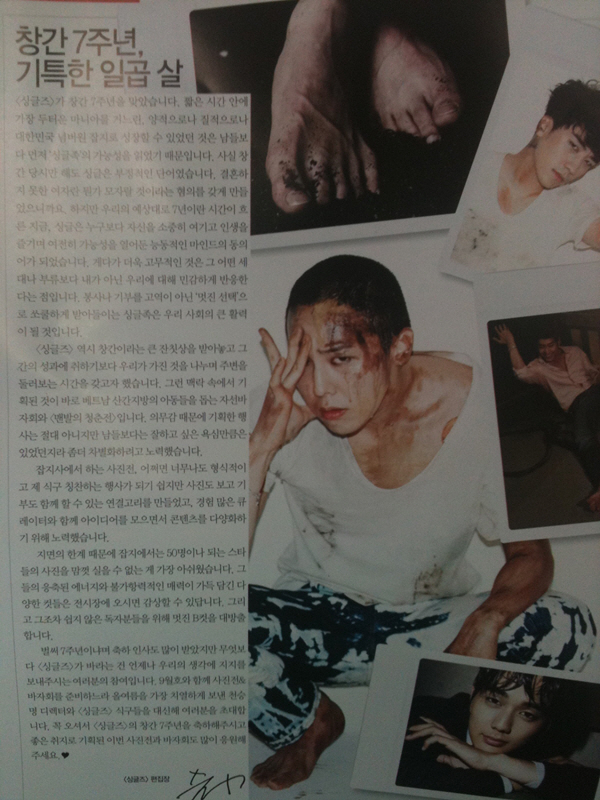 ), there is a matter of the Dazed & Confused Korea editorial (five-cover split, what?! *head splode*) of the group wherein they sport big-shouldered blazers with gobs and gobs of gender-bendy necklaces that are very, sweetie-darling-sweetie LOUCHE in a way that has me biting my fist. Just look at their nail beds on this Facebook page. Makes me feel sljdflsdjlksjlkdsjflkjdsf inadequate in 9283749237498327423 ways—just how I like all my fake boyfriends to make me feel. On August 9, it was announced that the Big Bang members became models for The North Face. 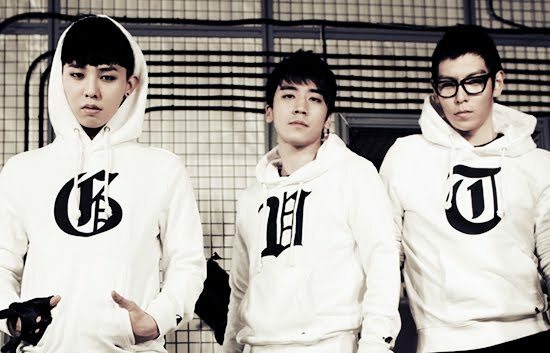 After that, some pictures were released in online community with the caption: “Clothing brand models -- Big Bang”. 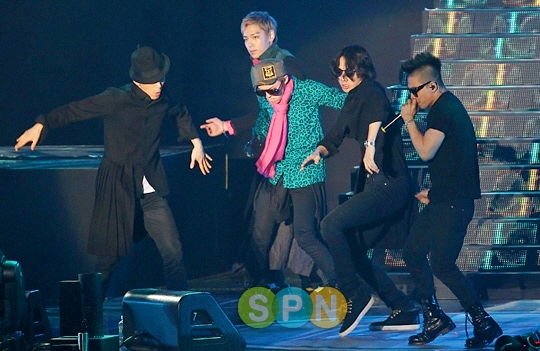 In the photos (posted here), Big Bang members looked like they were having a lot of fun. The photos included one showing Seungri climbing up a [rock climbing] wall and a photo of the members sitting inside a tent. 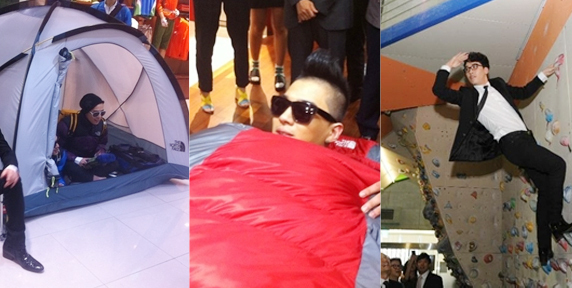 Taeyang's photo lying inside a red sleeping bag also attracted attention. G-Dragon and Seungri for Singles Magazine "Barefoot Campaign"
‘Singles‘ magazine has launched a charitable campaign called the ‘Barefoot Campaign’ to raise awareness about less fortunate children in third world countries who lack shoes for their feet. Having released an emotional picture of 2AM’s Seulong earlier, we’re now following up with photos of G-Dragon, B2ST, and actor Yoo Seung Ho. Many of Korea’s famous photographers participated in the campaign alongside some of the nation’s top youth stars. Photographers Kim Je Won, Bo Ri, Choi Yong Bin, Hong Jang Hyun snapped emotive portraits of Yoo Seung Ho, G-Dragon, Song Joong Ki, B2ST, Yoo Ah In, Ji Sung, and Lee Dong Wook. 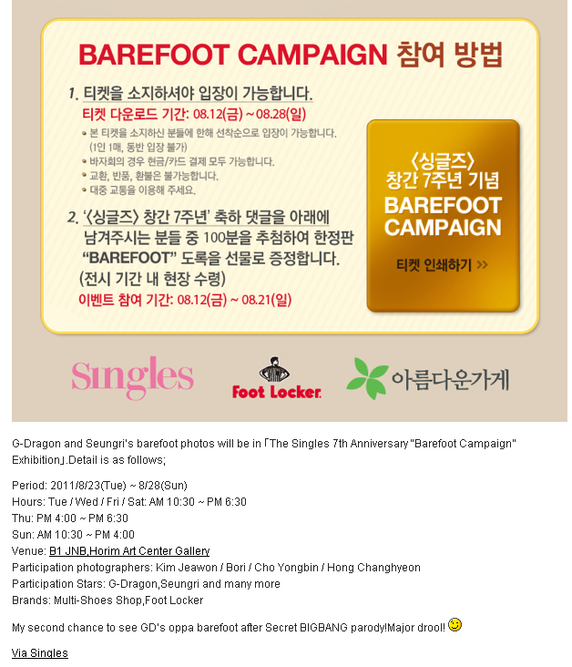 An exhibition of photos from the ‘Barefoot Campaign’ will take place from August 23rd to the 28th at the Seoul Shinsadong Horim Art Center. Proceeds from the event will be used towards a shoe campaign for children in the mountainous regions of Vietnam who are unable to wear shoes. From what I understand, it's an event by Singles magazine, in commemoration of their 7th anniversary, and to raise awareness about the suffering of barefoot kids in 3rd world countries. 4 photographers, and top 50 male stars took part in this campaign. Basically, the stars took photos barefooted, and these photos will be exhibited. 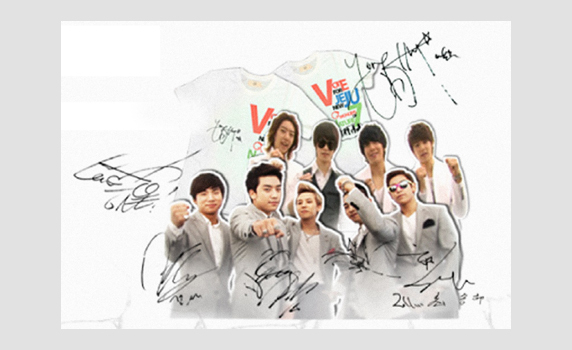 There is also a charity auction..I guess they'll be auctioning the photos? not sure. G-Dragon is also listed as a participant (3rd row, 2nd last name). The photo exhibition runs from 23rd to 28th august, and is expected to go to Busan mid Sept.
BIGBANG PRESENTS "LOVE&HOPE TOUR 2011"
Making of BIGBANG presents "Love and Hope Tour 2011"
Visual Commentary of "Love and Hope Tour 2011"
What are the ideal types of the idols? There is a trend of the idols to make confession of their ideal types recently. However, in the past, they tended to cover it up. There are now a lot of honest stars who confess they like other stars of the same industry. Such confessions have attracted a lot of attention. Let's review the idols' choices now. Singer IU has chosen Taeyang of Big Bang as her ideal type which has attracted attention. In an episode of MBC 'Rockman' (March) , IU was asked who her ideal type was. The MC asked, 'have you changed your ideal type?' IU answered, 'my ideal type is still Taeyang of Big Bang.' The MC elaborated , 'in fact, Taeyang is just like a 'god' type figure to IU.' which made Kim Tae Woo felt bitter. IU then responded by saying athough Kim Tae Woo was not her ideal man, he was still her senior singer whom she could learn from. The sad expression worn by Kim Tae Woo aroused laughters. Sandara Park of 2NE1 said G-Dragon of Big Bang is her ideal type. She said in KBS 2TV 'Entertainment Tonight', 'If I have to choose a male role model, I think it should be G-Dragon.' when she was asked about love-related questions . -They are also the first Korean artists to ever perform at this event. -Tickets are $38 (for just the concert area). -They'll perform at the Padang Stage in Zone 4. Fans of K-pop have good reason to bring the house down this September at the 2011 FORMULA 1 SINGTEL SINGAPORE GRAND PRIX. For the first time ever, Singapore GP has added the dynamic trio of Korean pop stars GD&TOP AND SEUNGRI to a line-up of world-class acts at the only Formula One night race. G-Dragon: Youthfulness is like a motorcycle! Adults say that motorcycles are dangerous and tell us not to ride on them, but don’t the children ride on them anyway? They even pursue for speed. Youthfulness seems to be like that too. You’re at the age where you don’t want to do the things you are allowed to do and want to do things you’re not. When you’re over the speed limit, you might miss out. You won’t know the correct direction and will blindly move forward and there will be lots of twists and turns along the way. The present me is like that and being a singer seems like I can’t be too sensible. I’m still worried though. I used to do things with no hesitation but nowadays, I need to consider all my options. This seems to be the process of becoming an adult, but it shouldn’t be like that. Seungri: I don’t like to lose. In fact I have a strong desire to win and that’s why my name is called “Seungri” (Victory). If people tell me that I can’t do something, I will want to do it. If they say I still can’t do it, I will want to do it even more. If there’s absolutely nothing else I can do, then my tears will fall. I think that is youth. Rather than the people who follow rules, the ones that exceed all expectations are those filled with youthfulness and energy. I hope that I can enjoy every moment and stay happy forever under any circumstances. 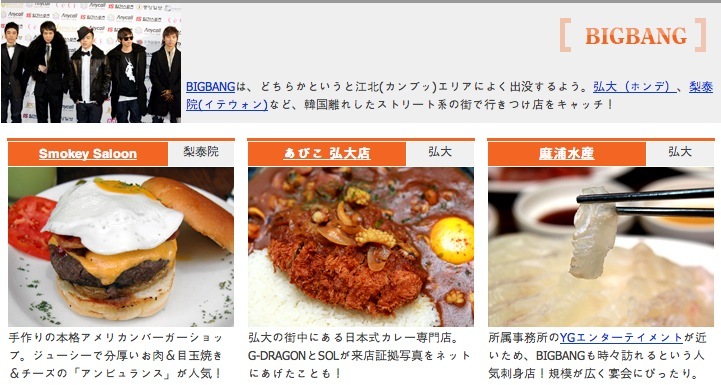 As K-pop stars are very popular in Japan now, fans are curious where they eat and what their favorite restaurants are. Popular burger joint Smokey Saloon is re-categorizing burgers in Seoul from fast food to luxury cuisine. Each burger is handmade with chuck steak and served with fresh lettuce, bacon, cheese, hash brown, fried eggs depending on your choice of menu. Their "Ambulance", a thick hamburger with cheese is really popular. They take a while to cook and serve, so don’t expect the usual quick service like other restaurants in Seoul. 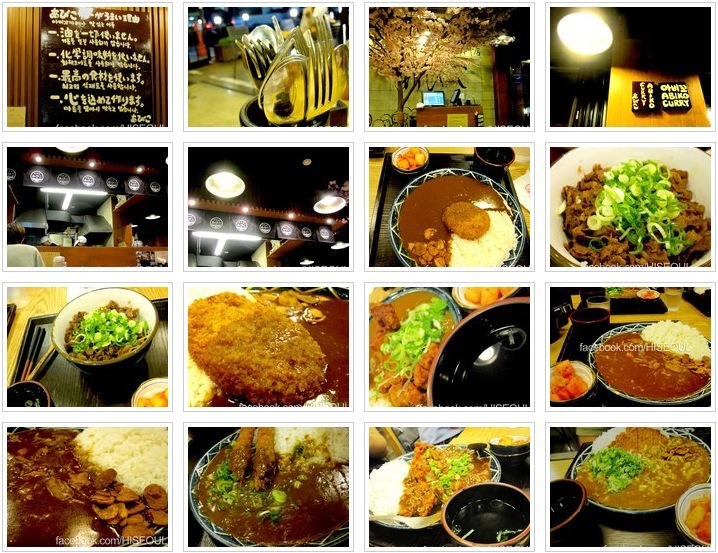 Specializing in Japanese curry, Abiko allows you to create your own MSG-free curry dish. Select your favorite curry, level of spiciness (6 to choose from! ), ingredient (beef, fried shrimp, chicken cutlet, etc. ), and enjoy! Beef curry with egg and chicken cutlet on rice is the most popular combination. Abiko is owned by 1TYM's Song Baek Young. Taeyang recently uploaded a photo of him and G-Dragon eating at Abiko on Twitter. This is a sashimi shop near YG Entertainment and Big Bang members often go here. Other celebrities like Lee Byung Hun, Jang Gun Seuk, JYJ, DBSK and Choi Ji Woo are also featured in the article. See complete list here. SBS will launch a ‘K-POP Zone’ for fans to see the Hallyu stars in 3-D. They will also be able to play games related to the idols. The piece of news has drawn the interest of the overseas fans. On the coming 31st, the SBS content , a part of the event of BROADCAST WORLDWIDE’ (organized by The Ministry of Culture, Sports and Tourism) will launch a ‘K-POP Zone’. When the plan was revealed, attention from the showbiz industry has been attracted. In BCWW2011, there are as many as 231 exhibitions held by 50 participating countries, for example, Britain’s BBC Worldwide, China’s CCTV, America’s NBC Universal,etc. Therefore, it will be the largest one ever since BCWW has held. In this exhibition, SBS designed to launch the ‘K-POP zone’ since Hallyu wave is sweeping all over the world nowadays. First of all, 3-D TV will be installed in the zone so the concerts of Big Bang, Beast ,CN Blue and the fanmeeting of Kara can be shown. Part of them will be shown in 3-D which can deliver a more realistic feeling. On the other hand, the posters and puzzles of other famous celebrities, like SNSD and Kara,etc will also be placed in this zone. Moreover, the OST of ‘Protect the boss’(a drama) , ‘I’ll protect you’ sung by JYJ’s Kim Jae Joong, 2NE1’s ‘Ugly’, ‘I am the best’ and Big Bang’s ‘Tonight’,etc will be used in the rhythm game ‘Crazy Lane’. While playing the game, you will be able to taste the experience of playing it with ‘Galaxy Tab’. BCWW2011 will be held from the coming 31st to 2nd of September at COEX and the ‘K-POP zone’ will also be available there. 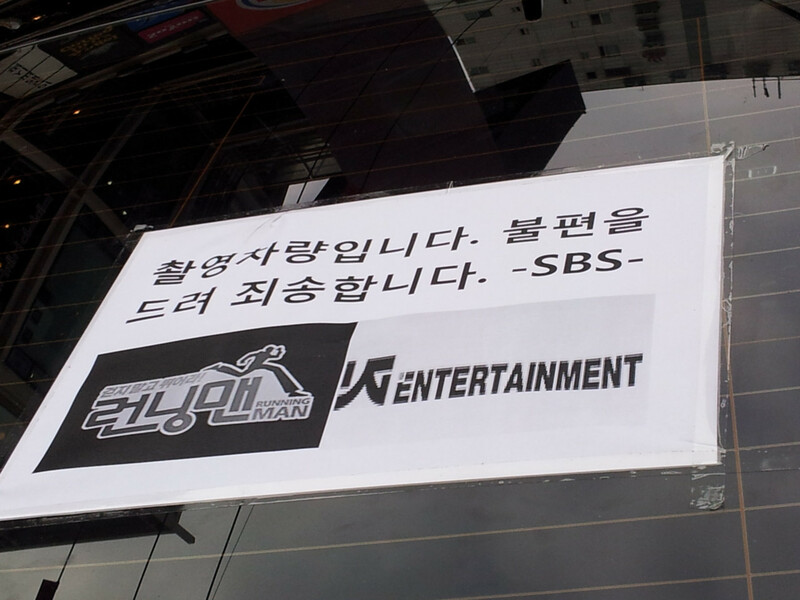 Rough translation: It seems that there is a car advertising about GD&TOP guesting on our show at Changwon. We do not have any plans of that sort. Please be careful. We will respond strongly if it is an impersonation. 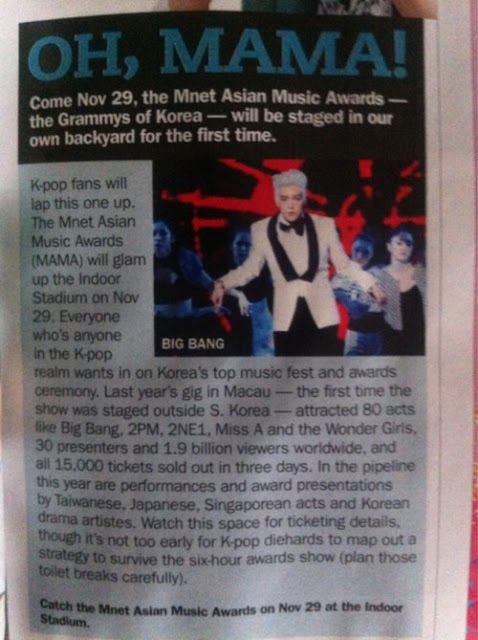 Big Bang to attend MAMA 2011 in Singapore? We are pleased to share more exciting news for K-Pop fans in Singapore! This year's 2011 Mnet Asian Music Awards will be held in Singapore on November 29, at the Singapore Indoor Stadium. For the second time, this major award show would be held outside of Korea. Last year's award show was staged in Macau at The Venetian and boosted an impressive line up of 80 acts featuring Big Bang, 2NE1, Miss A and award presenters such as Yoon Eun Hye. As informed by the local organizer, on the same day of the award show, fans around Asia can also catch it on television. Some networks will be having a live broadcast while others could have a 2-hour delayed telecast. Fans from Singapore may watch this on Channel U (2-hour delay telecast). Ticketing details are still being worked out. Interested Soompiers may wish to follow Mnet's MAMA page on 'Facebook' or stay tuned to our site for updates. The organizer would be issuing an official press release very soon. 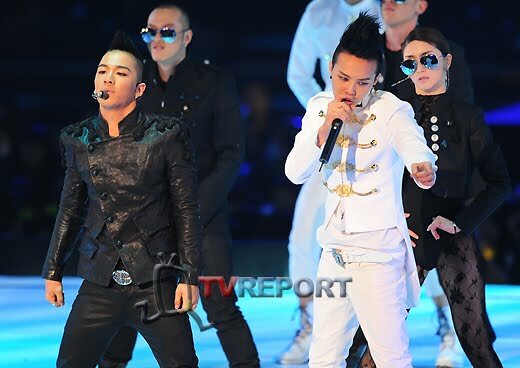 Lets flash back of Big Bang performance during MAMA last year! "RAGAZZA" an Italian magazine, has been recently hit with the Kpop bug, they have dedicated an article to KPOP music and BIG BANG was mentioned as one of the most successful Korean bands. Kpop what? That's what we tought when we proposed kpop music to our editorial staff. But we went on youtube, watched some videos...and we've been swept away by the rhythm of Korean music. So we decided to know more about these Korean idols. The bands and the artist who invaded the Korean music industry and even the western music industry - thanks to the web - have different music styles. Groups like Big Bang, Super Junior, Wonder Girls, SS501 or artist like BoA, Rain and SE7EN play and sing pop music, but also R&B, Hip Hop and Rock. Find them on the web!! without forgetting many groups you can find on facebook things like like : SE7EN's italian fanpage, Kpop <3 Italia, etc. 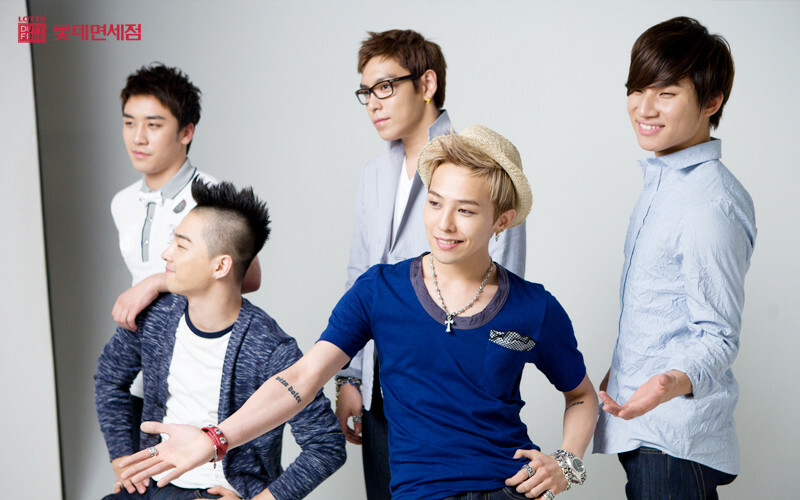 G-Dragon, T.O.P, Taeyang, Daesung and Seungri are the five members of one the most successful South Korean boy-bands. They became the first foreign group in Japan to receive the Japan Cable Broadcasting Award for "Best Newcomer". When he was 15 years-old, YG Entertainment took him as a trainee and he trained in singing and dancing. The outcome? Today SE7EN is an international popstar who sang even in the United States. 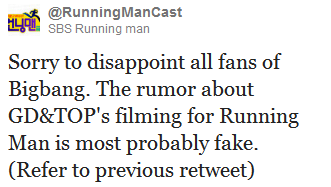 Note: Only parts having to do with YG Entertainment were translated. 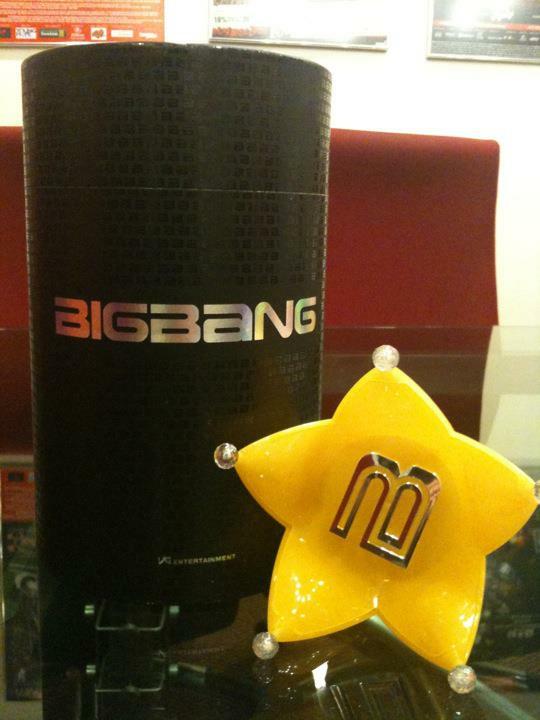 Big Bang was selected as the star of September by SBS Gorealra Star Channel. ‘Star Channel’ is a channel of SBS Gorealra where you can watch the video of the stars 24 hours for the whole month. It was a channel first established in August and was well received by the netizens. The star of August was ‘2PM’ and they were chosen by the netizens through the site of SBS since 2PM was the group idols they wanted to see on the channel most. The SBS program which Big Bang has appeared (e.g. SBS Inkigayo, Strong Heart, Running Man, Chocolate, Night After Night, Family Outing,etc) will be aired on this channel 24hours on a daily basis. You can watch SBS gorealra on the Star Channel or you can also go to SBS website to view the videos. YG Entertainment stunned the industry when it was revealed that they’ve surpassed SM Entertainment in terms of sales for the first half of 2011! YG Entertainment is home to artists like 2NE1, Big Bang, and Psy, while SM Entertainment hosts artists likes SNSD, Super Junior, and TVXQ. YG Entertainment has made 44,744,823,563 won (approximately $41,756,037 USD) from January 1st to June 30th. Meanwhile, SM Entertainment has made 40,592,465,358 won, which is approximately $37,867,691 USD, for that same period. It’s speculated that the profit leap for YG Entertainment came from GD&TOP‘s album, Seungri‘s solo activities, Big Bang‘s new album, and 2NE1‘s latest mini-album and concerts. YG Entertainment maintained their sales numbers from last year; however, SM Entertainment made 6.9 million won less, since they recorded 47,527,869,269 won in the first half of 2010. YG Entertainment’s net profit is said to be around $6,718,774 USD, while SM Entertainment’s net profit is reported to be around $3,659,605 USD. Updated! 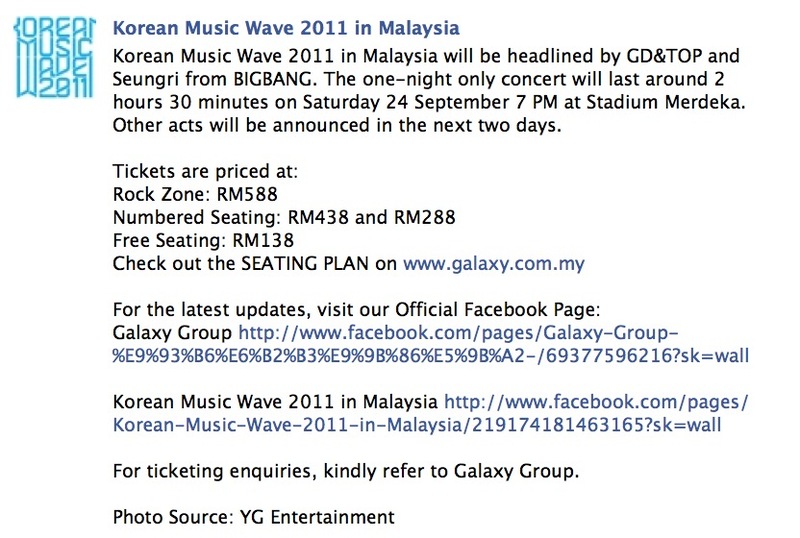 GDTOP & Seungri for Korean Music Wave 2011 in Malaysia! Kuala Lumpur, 6 September 2011 – Galaxy Group, Proof Label and Tomato. M, the Co-Organizers of the ‘Korean Music Wave 2011 in Malaysia’ today announced that its concert tickets will be going on public sale from 7th September 2011 onwards. The biggest Korean music sensation Malaysian has ever seen is scheduled on 24th September, 2011, 7pm at Stadium Merdeka, Kuala Lumpur. 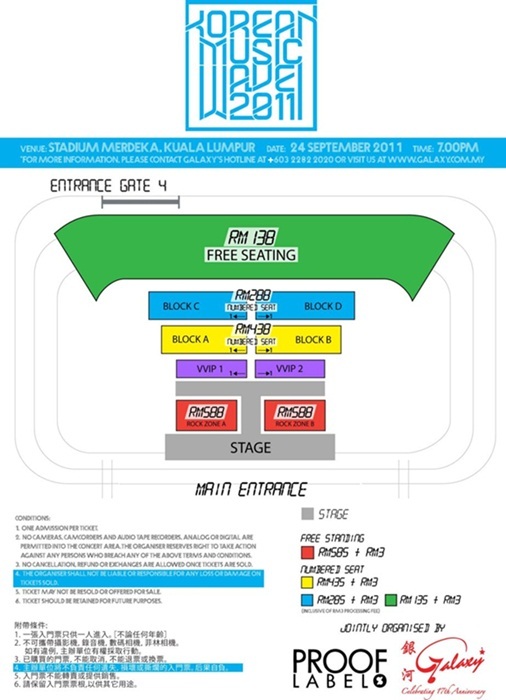 The concert tickets are priced at RM588(Rock Zone), RM438 & RM288(Numbered Seats) and RM138(Free Seating). The organizers are happy to reward customers with 10% discount on all seated ticket tiers and a special lucky draw session. Customers who purchase tickets from Galaxy office, Mid Valley City and Galaxy Ticket Counter, Plaza Sungei Wang only on the launch day, may stand a chance to walk away with limited edition celebrities’ merchandises, including BIGBANG official light sticks and etc. The lucky draw result will be announced on 9th September via Galaxy Group official facebook. Online ticket purchase will also be activated on 7th September via ticketcharge.com.my. For more information, please call Galaxy hotline 03-22822020 or visit galaxy.com.my. 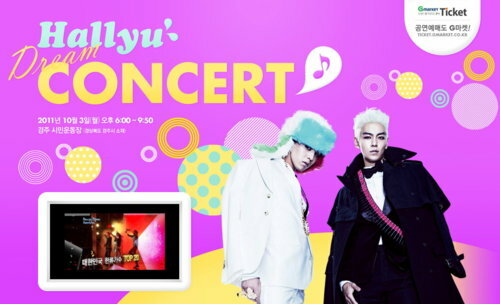 GDTOP & Se7en to perform @ Hallyu Dream Concert 2011! Many of Korea’s top Hallyu singers will be coming together once again to perform for the ’2011 Hallyu Dream Concert‘! Taking place on October 3rd at Gyeongju’s Citizen Stadium, this year’s event boasts an impressive lineup! TVXQ, SNSD, 2PM, SHINee, miss A, GD&TOP, Se7en, SECRET, ZE:A, Davichi, 4minute, B2ST, G.NA, T-ara, SISTAR, MBLAQ, and INFINITE will all be performing for the event. JYP picks Taeyang, Teddy, and Sandara as the artists he would scout from YG! On the SBS TV “Midnight TV Entertainment,” the judges to up coming survival audition program, “Kpop Stars,” Yang Hyun Suk and Park Jin Young, were guests in an interview. In the program, Yang Hyun Suk chose 2PM’s Nickhun, Wonder Girl’s Sun-Ye, and Miss A’s Suzy, from the roster of JYP Entertainment’s artists. According to Yang Hyun Suk, “I chose Nickhun, who comes from overseas, because he’s extremely good-looking,” he said, citing his reason. Next, he told the reason as to why he chose Sun-Ye, “I first saw her during an old audition program of Park Jin Young, and ever since the first time, I’ve thought that she’s good,” he said. When asked why he chose 1TYM’s Teddy from YG Entertainment, Park Jin Young said that he wished him to come as a singer. Park Jin Young also stated that another reason is that Teddy also makes/produces excellent kind of music. Park Jin Young also added, “I really like to dance and to sing, and I think that the way Taeyang dances and sings is really superb,” he replied, giving the reason why he wanted Big Bang’s Taeyang. Park Jin Young also chose 2NE1′s Sandara Park as his final choice, “I think she possesses a very unique charm, which cannot be seen in other female stars,” he said. Yang Hyun Suk then commented with, “I gave a nickname to Sandara, I call her ‘the woman from Mars’,” he said, “That’s because she has this really unusual way about her. I’ve known her for years, and I really think that it’s unlikely she’s from Earth,” he said, evoking laughter. Puerto Rico keeps making headlines in the KPOP world, this time it has to do with their biggest achievement yet regarding the spread of KPOP music in Latin America. On September 1st, 2011, Kpop music made its debut on the radio airwaves of the island. Many fans had taken the task of requesting their favorite KPOP songs to different radio stations, however, their efforts were of no avail, as they kept being turned down by the radio stations. Both Puerto Rico Also Loves Kpop and Kimchi Criollo —their KPOP and Korean Culture fanbases— came together to request Big Bang's "Tonight" to HOT 102.5 FM, a radio station that focuses on playing major hits around the world and plays the audience's requested songs, after almost a week of talking to the radio station, Big Bang's Tonight began playing on September 1st throughout the day. DJ: "It's 7:39pm, I told you!...I was going to play it at this time, for the Kpop lovers..."
"...directly from Korea, they are BIG BANG..."
"like I promised, you know, this is for the crew that was requesting BIG BANG since a few days ago the BIG BANG song, it's exclusively on HOT 102"
DJ: "If you like it, tell your crew... BIG BANG, directly from Korea they are really hot right now, more than 25MIL views on YouTube...Peacemaker here, exclusive of HOT102"
This doesn't end there, Tonight has been playing on the radio station for a week now, and not only that, the DJ seems to have liked yet another BIG BANG song, as SOMEBODY TO LOVE was heard early this week too. DJ PEACEMAKER sent a shout out to the KPOP fans in Puerto Rico, you can check it out here! 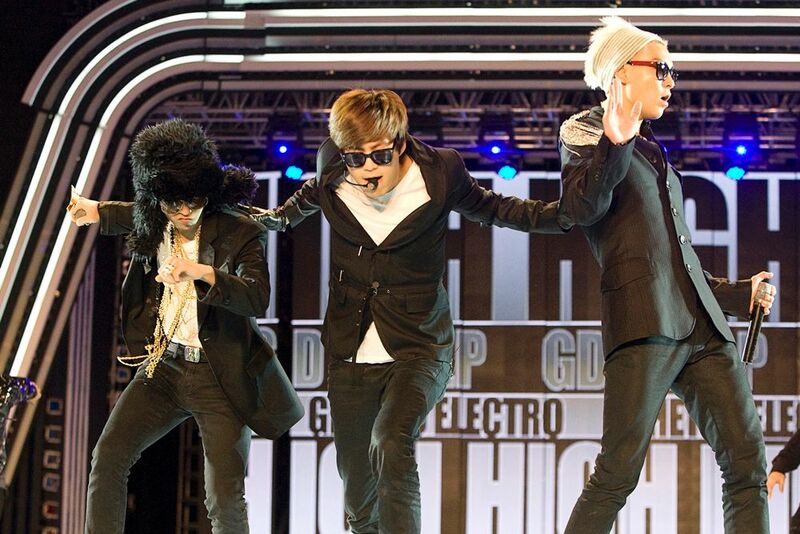 GDTOP & Seungri for 2011 Formula 1 Singapore Grand Prix! They wowed the audiences during their performance in the recent Korean Music Wave and they will continue to do so on September 23! GD&TOP and Seungri has been added to the line-up of world class acts at the 2011 Formula 1 Singtel Singapore Grand Prix. * It is a free-seating event. Race promoter Singapore GP is pleased to unveil SHAKIRA, GD&TOP and SEUNGRI also BOY GEORGE as the latest acts to join the entertainment line-up at the 2011 FORMULA 1 SINGTEL Singapore Grand Prix. This is in addition to the previously announced performances by Linkin Park, Shaggy, Rick Astley, Charice and Massive Attack's Daddy G & 3D. on the same day at Zone 4! You can get the Friday Single-Day Walkabout ticket at $38 to watch them as well as hours of live race in action. If you are a fan of the Formula 1 Grand Prix, you can also purchase the Three-Day Grandstand tickets priced from S$298. There are also plenty of bleachers offering vantage views of the Formula One track action. For more information on the performing acts throughout the event, click 'here'. Entertainment schedule is being fine-tuned, we’ll tweet when it’s available on www.singaporegp! Tickets for the event can be purchased through online at www.singaporegp, via the ticketing hotline +65 6738 6738 or all SISTIC outlets. YG Entertainment‘s Yang Hyun Suk recently joined SBS‘s ‘Survival Audition K-Pop Star‘, a program that seeks to stand out from all other audition shows by finding and cultivating the next star, and putting them on an elite course to success. A lot of attention is now being focused on the criteria for the program. Yang Hyun Suk recently sat down with OSEN for an interview detailing what he looks for in a trainee. He first revealed that trainees join YG in two different ways. Talented individuals will be approached by the company first, while others are chosen out of the hundreds that apply for the company. On the topic of Kang Seung Yoon, he revealed, “Whether it will take two years or three, it’s anyone’s game. It all depends on his skills.” When asked when he would be making his debut, Yang Hyun Suk replied quickly that he was adamant about not allowing trainees to stand on stage unless they were thoroughly prepared as singers. Before Kang Sung Yoon, senior artists like Se7en, Big Bang, 2NE1,and Gummy also had to endure rigorous training as well. It’s reality that while some trainees shine like stars, others end up in the dust like a flower that never got the chance to bloom. “My trainees are all children who have talent not made through effort, but through talent they’re born with. To put it simply, only the kids that have it will survive. There are a lot of kids who let their talent rot and still fail. Children with natural-born talent can be usually divided into two different types of people. The first are the types that rise to the position of ‘best’ because they continue to still strive to improve their talents. The second are the trainees who don’t practice because they know that they’re good. Of course, YG doesn’t let lazy prodigies just slide. We either let them die out or try to fix it. This is where the great system we’re known to have comes from,” he explained. MTV Asia (Singapore) will be interviewing Big Bang. If you have some questions you want to ask Big Bang, just tweet it with the hashtag: #askbigbang. ## The cover art/jacket of each version will be different. YG artists G-Dragon and TOP will be revealing their first Japanese single under their sub-unit in November. The single’s title track will be a Japanese version of “Oh Yeah” which features 2NE1′s Bom as an extra vocalist. “High High” was said to be included into the tracklist as well. Both songs had their lyrics revised for a Japanese release, and were made to fit to the original one as much as possible. 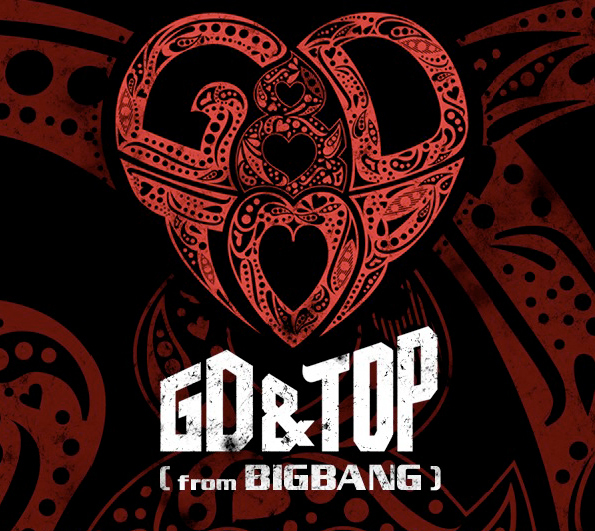 Both songs were originally featured on GD&TOP’s debut album. The Big Bang unit made it easier for both its members to put out music that wouldn’t be fitting for the whole group. Their first album was revealed last December and was well received by the Korean fans. Russia has been feeling the K-Pop wave for some time now thanks to the development of the Internet, but the wave seems to have gotten stronger as of late, as they're now focusing their efforts on bringing K-Pop stars straight to their doorsteps. On September 13, Yang Min Jong, the director of the Korean Cultural Center in Russia, revealed, "On September 6, the "K-Pop Cover Dance Festival" was held in Moscow. Ever since then, Muz-TV, a channel that focuses on music and entertainment news in Russia, along with other concert sponsors, has been making visits to the center asking for information on a number of Korean idol stars. They've even made digital music contracts as well as invite them to perform in Russia." 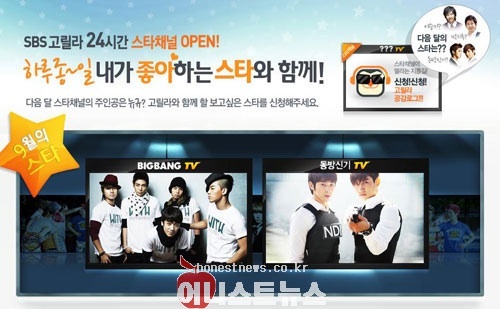 Muz-TV revealed that if contracts worked out, they would be showing K-Pop music weekly. The channel held an online survey at the end of August to see which groups were the most popular. Survey results showed that Big Bang, SHINee, Super Junior, DBSK, the Wonder Girls, JYJ, SNSD, BEAST, and 2NE1 were the hottest idols among the youth. "High school and college students who fell in love with K-Pop through the Internet and YouTube have been making calls or sending letters asking us to air K-Pop-related content. This is why we suggested working with the Korean Cultural Center to make this a possibility. About 5,500 people participated in an online survey last month, and 4,500 of them voted for K-Pop as the genre they'd like to hear the most," an official from Muz-TV said. Another concert host has also expressed an interest in bringing in 12 idol groups to perform in Moscow. British VIPs came out in force to show their love for Big Bang at the Mayor's Thames Festival, held in London on September 10th & 11th. The Korea Calling area, organised by the Korean Cultural Centre showcased various Korean arts, but the highlight for the hundreds of KPop fans who attended was the Kpop Party on Saturday night! Whilst the DJ played an hour long mix of various artists, it was Big Bang's songs which got the biggest reaction! 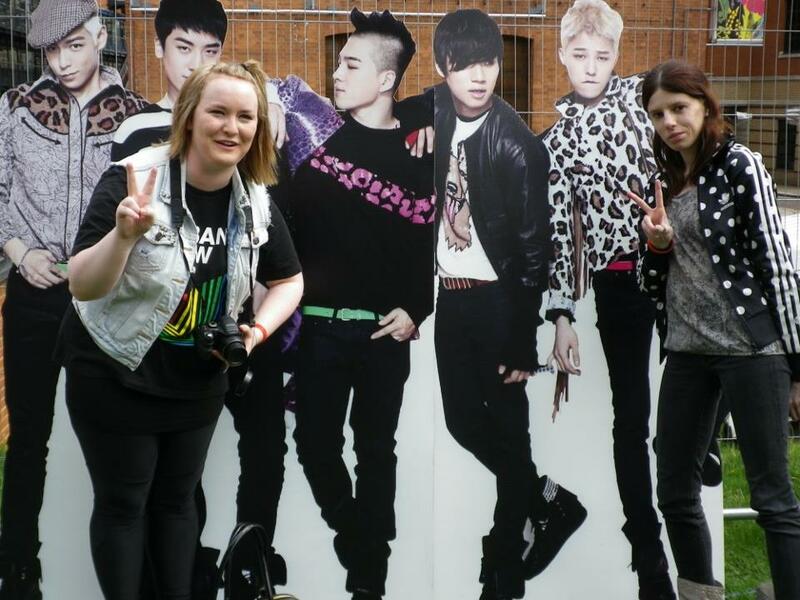 Fans also got to sing along to their favourite Big Bang songs in the Karaoke Zone and pose with lifesized cardboard cut-outs of the band. Artists under the "Big 4" agencies (YG, SM, JYP, and Cube Entertainment) have dominated music program wins this year, taking home around 74% of the winner’s trophies! Out of those 108 trophies, 80 of them went to artists under the "Big 4". Starting with SM Entertainment, TVXQ won 9 times, f(x) won 10 times, and Super Junior won 11 times, totaling to 30 trophies. SM and YG combined total to 57 trophies, dominating about 53% of the total trophies won this year. Putting all of the "Big 4" together totals to 74% of the trophies this year. Teams that put the "Big 4" aside included SECRET‘s “Shy Boy” with five wins and “Starlight Moonlight” with one win, totaling to six wins together. CNBLUE won seven times for “Intuition”, Kim Hyun Joong‘s “Break Down” won four times, T-ara‘s “Roly-Poly” won three times, Jay Park‘s “Abandoned” won twice, and INFINITE‘s “Be Mine” won twice. Welcome to the first edition of ‘Allkpop Top 10 Countdown‘, where we throw down a premier list of what we think rounds up the best of the best in the K-Pop industry, depending on the theme of each issue. We kick off our series with a deceptively-simple question: What are the Top 10 music videos released in 2011 thus far? It was a gargantuan task, but we’ve sliced through hordes of music videos to deliver a sleek figure of 10, all based on factors of concept, production, creativity, innovation, and impact. #3: Big Bang- "Love Song"
Conceptual music videos from idol groups are hard to come by, and we can always rely on Big Bang to go the extra mile to set themselves apart from everyone else. “Love Song” doesn’t have crazy dance routines, flashing LED lights, or complicated stage outfits. The video doesn’t even have color. We do get to see the boys walk through a bunch of garbage on fire and look completely unaffected by a car falling from the sky, but cool content aside, the noticeable feature about this video is that it was all done in one take, without any cuts. 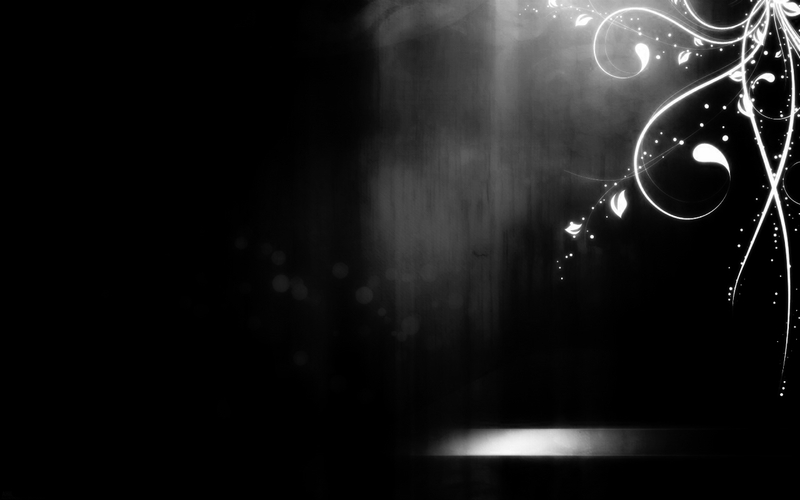 This means every aspect of the video recording was planned out and choreographed meticulously by the frame. The group probably went through as many cuts as GD went through guitars, but the flawless result made it all worth it. 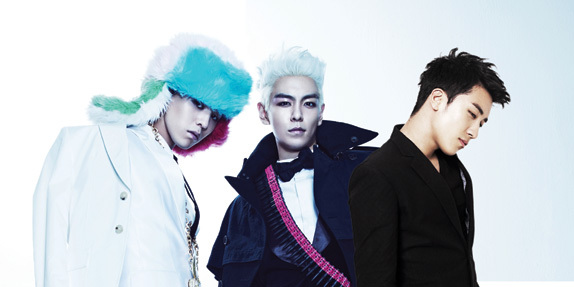 Big Bang working on new songs with Japanese R&B singer Shikata? Shikata, a Japanese R&B singer who worked with Big Bang before, updated his blog yesterday (16th) that he's going to South Korea (on the 17th) to work on "something interesting" with BIGBANG. He didn't provide any other info. He also worked (as a composer) with JYJ for the song, Itsu datte Kimi Ni (With You Always). The hallyu wave continues spreading, we had already mention the undying efforts of Mexican fans to spread the Kpop love-bug, they continue to bear fruit, as Big Bang was mentioned in the very popular teen magazine "Tú". "Tú" is a teen pop magazine that is not only distributed in Mexico but all around Latin América, it's very popular among Spanish-speaking countries. On the cover of the June, 2011 edition, you can see in the bottom left corner a title which reads "KPOP: Get to know the best bands", and we have translated the Big Bang section for you. 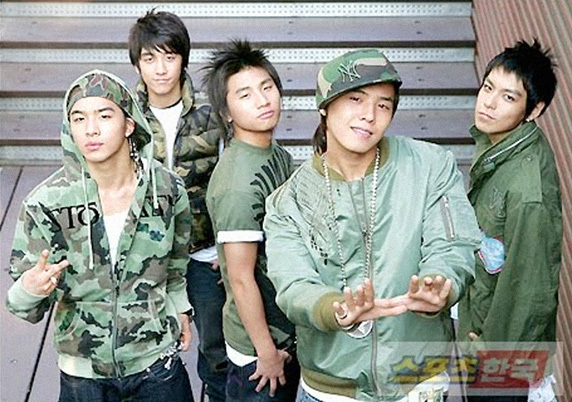 G-Dragon, Taeyang, T.O.P., Daesung and Seung Ri. G-Dragon suggested the name “Diamond” that the name BIG BANG came about. recognition in the Kpop world. 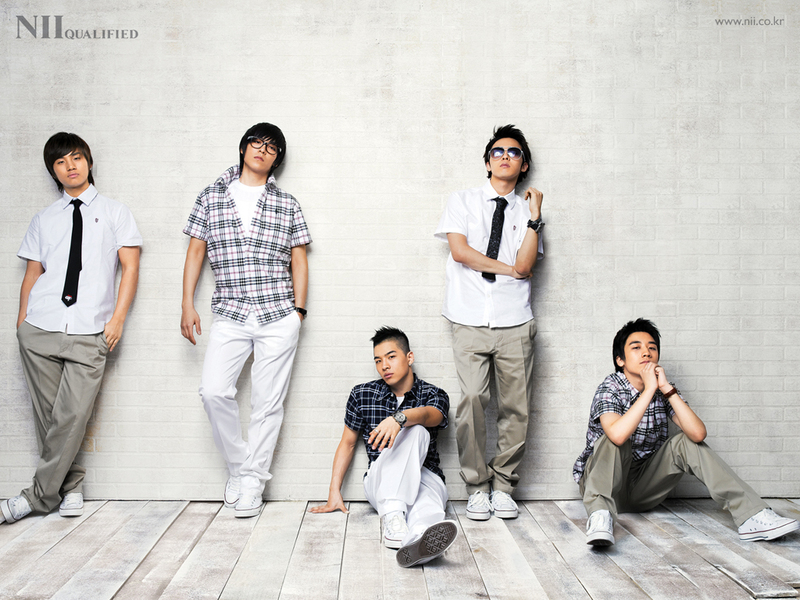 In 2007 they released their single “Lies” (Geojimal), with which they reached success in Korea. 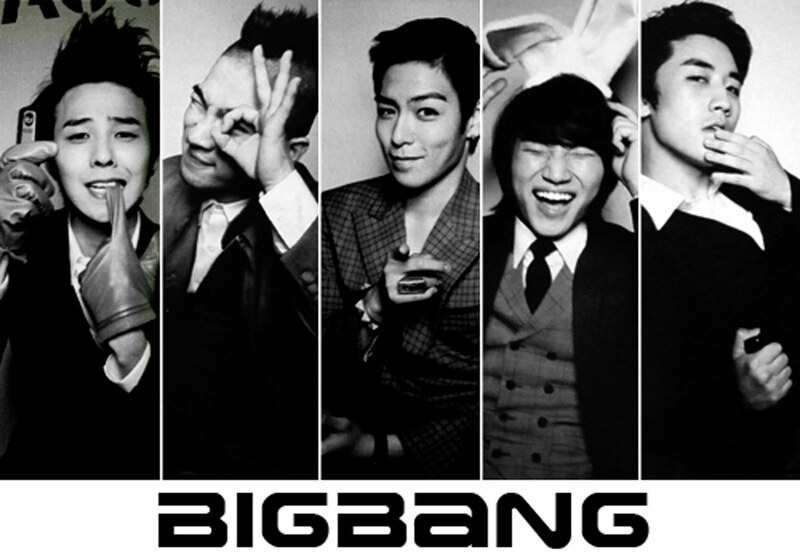 BIG BANG has their official fanclub in Korean, they are called “V.I.P” (because of their second single “BIG BANG is V.I.P”), they are different from other fanclubs as they don’t have a specific symbol which identifies them, they support the group with black and white handkerchiefs during their performances. Some of the most requested songs are “Love Song” , “You’re My”, “Bringing You Love”, “This Love”, “Haru Haru”, “La La La”, among others. They included the links to the "Haru Haru" MV and G-Dragon's "This Love" as well as some pictures of the boys. 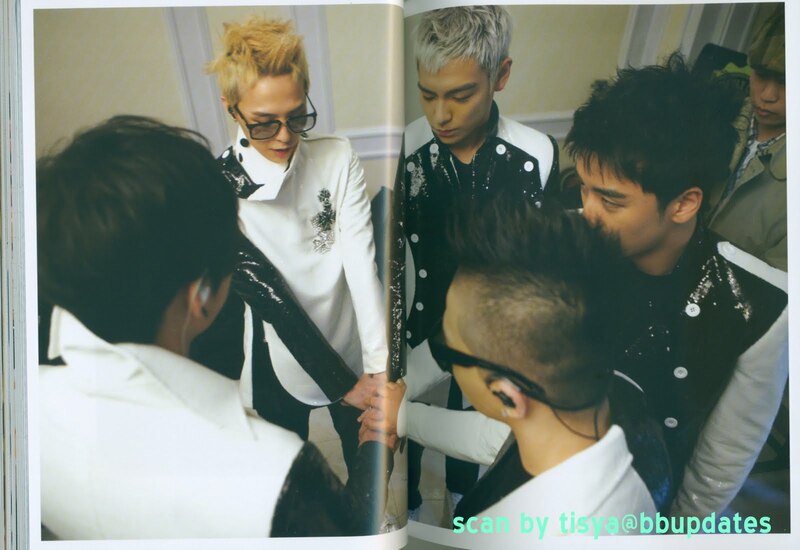 UPDATE: These is the magazine spread and a close-up of Big Bang's picture. YG & JYP chooses "Who would they Scout From The Other's Agency"! Yang Hyun Suk and Park Jin Young chose singers that they would like to scout from the other’s rival agency. Park Jin Young also added, “I really like to dance and to sing, and I think that the way Taeyang dances and sings is really superb,” he replied, giving the reason why he wanted Big Bang’s Taeyang. Park Jin Young also chose 2NE1′s Sandara Park as his final choice, “I think she possesses a very unique charm, which cannot be seen in other female stars,” he said.Yang Hyun Suk then commented with, “I gave a nickname to Sandara, I call her ‘the woman from Mars’,” he said, “That’s because she has this really unusual way about her. I’ve known her for years, and I really think that it’s unlikely she’s from Earth,” he said, evoking laughter. Singer Lee Moon Sae spoke up about boy group Big Bang remaking his original version of “Sunset Glow“. On a popular KBS 2TV entertainment program that aired on the 20th, Lee Moon Sae sang the classic song himself, and he told the backstory to how the Big Bang remake came about. “I didn’t do much to help,” he continued. “G-Dragon put my name in the rap for me. When I do events, I actually sing the Big Bang version of “Sunset Glow”. That’s the only way I can get the 20-something year olds get up and start clapping!” he said, which caused everyone to burst out in laughter. While on set, Lee Moon Sae continued to make everyone laugh with his hilariously witty remarks. Who are the best dance idol groups ranked by professionals? According to a recent report, there is estimated to be a total of 100 teams of boy and girl idol groups in the Korean mainstream music scene by the end of 2011. However, these groups are usually judged on the basis of popularity and their fans rather than by professionals. With that said, how would professionals rank the groups? 27 choreographers and dancers were asked to pick the groups with the best performances. Idol groups usually use their performances to visually deliver their music. The performance that goes along with the song is the weapon of idol groups to captivate their fans.